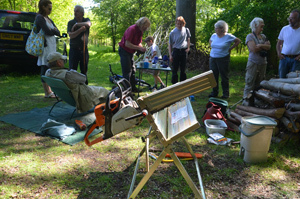 On a beautifully hot and sunny May day, Mike welcomed a group of existing and potential woodland owners to Ferriby Wood, in the Yorkshire Wolds. 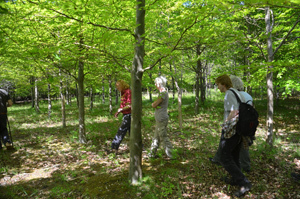 The purpose of the gathering was to share experiences of woodland ownership. Folks met at his clearing where a fire was burning and the kettle was on. After a cup of tea and an introductory chat, we set off on a guided tour. Mike showed us how he has been managing his woodland in the five years since he bought it, looking first at a small section of coppiced ash. He explained that he has been selling the poles to his local allotment association for use as bean poles, the ash he had coppiced will regrow to produce more bean poles in the coming years. Some poles had been left un-cut to grow on and form standard trees. One area was left untouched and we could all see how densely the ash was growing before his work had begun. The majority of Mike’s woodland was planted about 20 years ago with beech and also a small number of oak and cherry. The long term plan for the woodland involves encouraging the oak to develop, so some clearing has taken place to allow more light in. 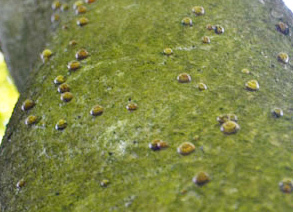 Growing in a wide strip along the northeastern boundary are some very large beech trees beneath which we found many deer beds, but the most puzzling thing we saw were quite literally hundreds of snails ascending one particular beech tree: Can anyone think of any reason this is happening? Back at the campfire Mike rustled up another round of teas (whilst we all put forward our thoughts on the question of climbing snails), Mike impressed all his guests with a demonstration in the use of his chainsaw logging device to conclude a most enjoyable gathering. Thanks to Mike for his hospitality, laying on teas and bacon butties. Ferriby is a lovely woodland to visit and it was great to meet all those who attended.